The first time I've read about Shang Tsu, I was completely sold to try it out. And since it serves Taiwanese cuisine, the first restaurant that I thought of was Yen Yen Taiwan Street Food. Hot tea was served initially and we started to check out their menu. The moment this was served on our table, I was quite surprised on how the oyster cake looked. It came in an orange colored sauce which seems to be sweet chili. The oyster pancake was different from the oyster cakes we've tried in chinese restaurants. The top layer was like ordinary egg omelette with greens and oysters. But what caught our attention was the clear glob of jelly underneath that gave a chewier texture to the dish. I guess that's what makes their Oyster Pancake special. Shang Tsu got 3 kinds of tofu dishes but we decided to get their Crispy Fried Tofu- deep fried tofu squares in thin crisp coating with silky soft tofu inside. The dash of spices on top of the tofu added saltiness and gave a more enhanced flavor to the dish. I recommend eating it as is as the sauce that came with it was extremely salty. An order of their rice set meals includes a cup of rice and assorted side dishes. The side dishes we got were mixed veggies, egg wedges and tofu. For the Tender Beef Stew, yes it was tender but the dish lacked flavor and was a bit bland. Our next orders reminded me of Tasty Dumplings which for me, still got the best porkchop rice ever. Shang Tsu's kutchay dumplings were wrapped in thin coating compared to that of Tasty's but judging from taste, I'd still prefer Tasty's over Shang Tsu's. I was a bit disappointed with their porkchop since I even asked the server if their porkchop is thick or thin. She told me that their porkchop are thin and big so I was expecting that they have the same porkchop as Tasty's. Turned out, it was still thick and serving was not even that big. The taste was somewhat similar to that of YenYen's only this was saltier and seemed a bit overcooked. On the other hand, the noodles that came with the porkchop was really big and can already be shared by two. It came in a huge bowl of clear broth with generous serving of bean sprouts and chewy noodles. 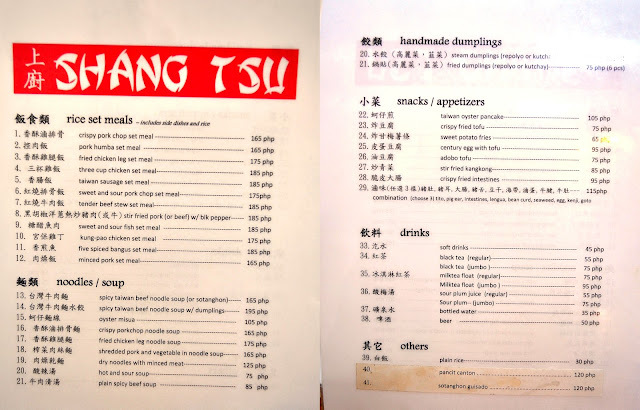 Honestly, I don't think we would visit Shang Tsu again any time soon. But we're not closing our doors in trying out other dishes from their menu. Hope to see them opened in Cebu. The food cost is just reasonable! How does Taiwanese cooking differ from ours? I've not tasted any such style of cooking by the Taiwanese. Food looks interesting. I haven't tried Taiwanese food yet, how is it different from the usual chinese cuisines? Eto lang talaga na miss ko sa Chinese food e... Sana meron din sila dito sa ortigas. Sayang their food items aren't there yet when it comes to taste. Mukhang masarap pa naman sana >.< Hope they improve their quality. Filipino, Chinese, Japanese or Taiwanese. people will definitely crave for it again and again.